Conditions on Robben Island were, for the first years, very harsh. The food was poor, the work was hard, the summers hot, the winters very cold and the warders brutal. Initially only one short letter and one short visit were allowed every six months. Physical suffering was significant; psychological pain was worse. The petty-mindedness of the authorities was unrelenting. The glass partition in the visitors’ room was an obscenity. Surveillance was invasive. Every letter to a loved one about deeply personal things was written with the knowledge that a third person, the censor, was also reading it. Over the years Mandela accommodated himself to circumstances, as the prison authorities (under pressure from the political prisoners, who fought the prison system relentlessly on issues of principle) made their own accommodations. Mandela’s privileges, and his capacity to secure leverage with the authorities, grew after his move to Pollsmoor Prison in 1982, especially after he inaugurated talks about talks with the apartheid regime in 1985. By the time he was moved to Victor Verster Prison in December 1988, where he occupied a spacious bungalow house of his own, he could see or communicate with whomever he liked. Frequently he was taken on trips out of prison, sometimes for high-level meetings, sometimes simply to see the sights. He was already a president-in-waiting. By the time Nelson Mandela was moved to Victor Verster Prison in December 1988, he was already a president-in-waiting. What had changed, what had brought Nelson Mandela to this point? What was the character of the man, that people recognised this man was of such integrity to be a President of a strife-torn nation? We enquire into the life and writings of Nelson Mandela in order that we might understand this transformation of the man the world admires so. Nelson Mandela spoke about childhood and growing up in Xhosa culture. It was due respect for and the strength of his culture that provided the foundation of integrity that was to transform a bitter, angry man into a man of peace. Mandela told stories of respecting prison warders of lesser intelligence and dealing with them as he would treat any other man. Most men, you know, are influenced by their background. I grew up in a country village until I was twenty-three, when I then left the village for Johannesburg. I was of course … going to school for the greater part of the year, come back during the June and December holidays – June was just a month and December about two months. And so all throughout the year I was at school … And then in 41 when I was twenty-three, I came to Johannesburg and learned … to absorb Western standards of living and so on. But … my opinions were already formed from the countryside and … you’ll therefore appreciate my enormous respect for my own culture – indigenous culture … Of course Western culture is something we cannot live without, so I have got these two strands of cultural influence. I came to accept that I have no right whatsoever to judge others in terms of my own customs, however much I may be proud of such customs; that to despise others because they have not observed particular customs is a dangerous form of chauvinism. I consider myself obliged to pay proper respect to my customs and traditions, provided that such customs and traditions tend to keep us together and do not in any way conflict with the aims and objects of the struggle against racial oppression. But I shall neither impose my own customs on others nor follow any practice which will offend my comrades, especially now that freedom has become so costly. President Nelson Mandela walks with Pope John Paul II after the pontiff’s arrival at Johannesburg airport September 16,1995. This was the Pope’s first official visit to South Africa. 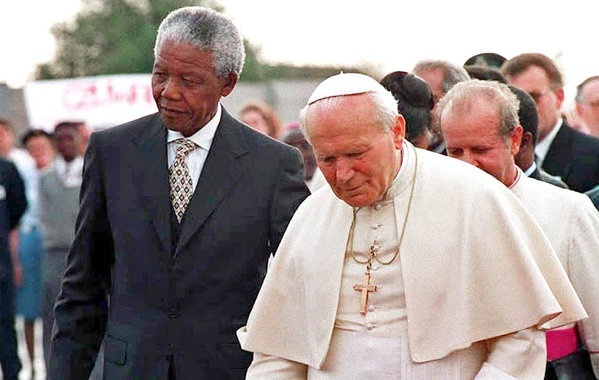 Nelson Mandela was to reflect that Pope John Paul II was an outstanding person. Mandela observed that the Pope was “Humble, very humble”. Mandela went on to say that he was touched and impressed, because when he was in jail he read a story about Pope John Paul II. The Pope had a holiday in the Alps and was then walking with one of his colleagues and he suddenly stopped and he says, ‘By the way, this is Nelson Mandela’s birthday today.’ Mandela also came to understand that the Pope was a man who appeared to take more than an ordinary superficial interest in affairs in South Africa. Nelson Mandela once told a parable on how he would convert people to peace. He called it the Parable of the Sun and the Wind. I was … contrasting the strength of peace over and above that of force and I told the incident … of an argument between the sun and the wind, that the sun said, ‘I’m stronger than you are’ and the wind says, ‘No, I’m stronger than you are.’ And they decided, therefore, to test their strength with a traveller … who was wearing a blanket. And they agreed that the one who would succeed in getting the traveller to get rid of his blanket would be the stronger. So the wind started. It started blowing and the harder it blew, the tighter the traveller pulled the blanket around his body. And the wind blew and blew but it could not get him to discard the blanket. And, as I said, the harder the wind blew, the tighter the visitor tried to hold the blanket around his body. And the wind eventually gave up. Then the sun started with its rays, very mild, and they increased in strength and as they increased … the traveller felt that the blanket was unnecessary because the blanket is for warmth. And so he decided to relax it, to loosen it, but the rays of the sun became stronger and stronger and eventually he threw it away. So by a gentle method it was possible to get the traveller to discard his blanket. And this is the parable that through peace you will be able to convert, you see, the most determined people, the most committed to the question of violence, and that is the method we should follow. When you are a public figure you have to accept the integrity of other people until there is evidence to the contrary. And when you have no evidence to the contrary, and people do things which appear to be good, what reason have you got to suspect them? To say that they are doing good because they have got an ulterior motive? It is until that evidence comes out that you then either deal with that point, with that instance of infidelity, and forget about it. Because that’s how you can get on in life with people. You have to recognise that people are produced by the mud in the society in which you live and that therefore they are human beings. They have got good points, they have got weak points. Your duty is to work with human beings as human beings, not because you think they are angels. And, therefore, once you know that this man has got this virtue and he has got this weakness you work with them and you accommodate that weakness and you try and help him to overcome that weakness. I don’t want to be frightened by the fact that a person has made certain mistakes and he has got human frailties. I can’t allow myself to be influenced by that. And that is why many people criticise [me]. People will feel I see too much good in people. So it’s a criticism I have to put up with and I’ve tried to adjust to, because whether it is so or not, it is something which I think is profitable. It’s a good thing to assume, to act on the basis that … others are men of integrity and honour … because you tend to attract integrity and honour if that is how you regard those with whom you work. And one has made a great deal of progress in developing personal relationships because you [make] the basic assumption … that those you deal with are men of integrity. I believe in that. 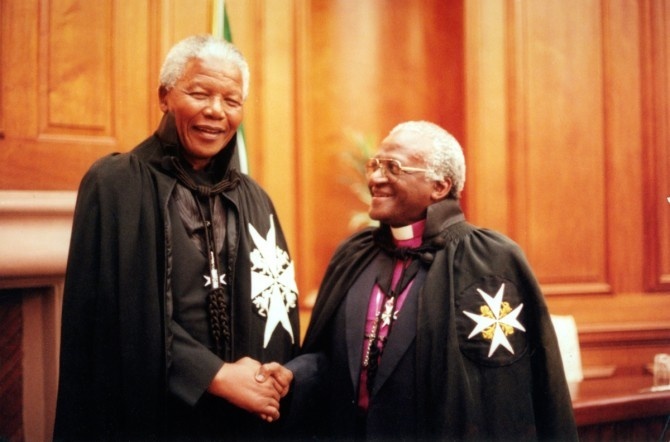 Nelson Mandela with Archbishop Desmond Tutu after the investiture as Grand Commander of the Order of St John; Mandela received the investiture on 23 November 2004. Archbishop Tutu was inducted as Chaplain and Sub-Prelate of Venerable Order of Saint John in 1995. Nelson Mandela was initially disaffected on the idea of becoming President of South Africa after leaving prison. He told that his installation as the first democratically elected President of the Republic of South Africa was imposed on him much against his advice. He said, “I advised against the decision on the grounds that I would turn seventy-six that year, that it would be wise to get a far younger person, male or female, who had been out of prison, met heads of state and government, attended meetings of world and regional organisations, who had kept abreast of national and international developments, who could, as far as was possible, foresee the future course of such developments. The boarding master is the man who is in charge of the students in a college, yes. Now this was a remarkable man … He once gave a sermon [about] a man whose house was haunted by evil spirits. He did everything to drive them out, but he failed. Then he decided to leave his kraal [a rural settlement of huts and houses], packed all his things on a wagon and started driving away to settle elsewhere. Along the way, he met a friend and the friend asked, ‘Where are you going?’ Before he answered, a voice came out of the wagon, ‘We are trekking, we are leaving our kraal.’ It was one of the evil spirits. He thought he was leaving them behind; he actually came along with them. And he says, the moral was ‘Don’t run away from your problems; face them! Because if you don’t deal with them, they will always be with you. Deal with a problem which arises; face it courageously.’ That was the moral … I never forgot that, you see, and I accepted that if you have a problem, you must face it and not gloss over it. For example, you know, in politics, there are very sensitive issues and people normally don’t want an unpopular approach. If people say ‘We must go on action’, very few people will say ‘Have we got the resources? Have we made sufficient preparations? Are we in a position to undertake this action?’ Some people like to give an impression of being militant and therefore not to face the problems, especially if they are the type of problems which are going to make you unpopular. Success in politics demands that you must take your people into confidence about your views and state them very clearly, very politely, very calmly, but nevertheless state them openly. Incidentally, you may find that the cell is an ideal place to learn to know yourself, to search realistically and regularly the process of your own mind and feelings. In judging our progress as individuals we tend to concentrate on external factors such as one’s social position, influence and popularity, wealth and standard of education. These are, of course, important in measuring one’s success in material matters and it is perfectly understandable if many people exert themselves mainly to achieve all these. But internal factors may be even more crucial in assessing one’s development as a human being. Honesty, sincerity, simplicity, humility, pure generosity, absence of vanity, readiness to serve others – qualities which are within easy reach of every soul – are the foundation of one’s spiritual life. Development in matters of this nature is inconceivable without serious introspection, without knowing yourself, your weaknesses and mistakes. At least, if for nothing else, the cell gives you the opportunity to look daily into your entire conduct, to overcome the bad and develop whatever is good in you. Regular meditation, say about 15 minutes a day before you turn in, can be very fruitful in this regard. You may find it difficult at first to pinpoint the negative features in your life, but the 10th attempt may yield rich rewards. Never forget that a saint is a sinner who keeps on trying. Among the multitude of those who have throughout history committed themselves to the struggle for justice in all its implications, are some of those who have commanded invincible liberation armies who waged stirring operations and sacrificed enormously in order to free their people from the yoke of oppression, to better their lives by creating jobs, building houses, schools, hospitals, introducing electricity, and bringing clean and healthy water to people especially in the rural areas. Their aim was to remove the gap between the rich and the poor, the educated and uneducated, the healthy and those afflicted by preventable diseases. Truth is the basis of the Universe. We have read of Nelson Mandela as a man who learned, lived and practised integrity. This – in large part – was fruit of his own culture and customs where dignity and respect for the other were practised. Mandela learned about his own prejudices early in life and resolved to treat all peoples as equals. Universal truths, Mandela told, are made evident by personal experience and practice. Insight and wisdom do not come without the practice of self examination, reflection and self awareness. Human integrity is the unity of thoughts, words and action, and good character is deemed, when this is seen and felt in action, by others. 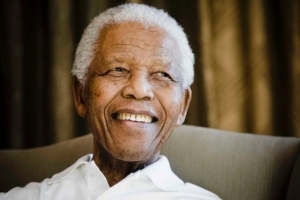 By such practice, Nelson Mandela transformed himself and others – indeed, a nation on the cusp of strife and civil disorder – into people of integrity, of good conduct and self respect. He learned well to deal with his own problems and not drag them about with him; he was no platform hero and practice zero, although he had admitted that in his life before prison, he was appalled to realise that as a young man, he had done these things. Self transformation is the result of self-sacrifice, self-respect, self-control and self-examination put into practice. These practices are found in many of the spiritual paths and faith systems of the world. That Nelson Mandela emerged from imprisonment and greeted the world with joy is witness to the authenticity and strength of his personal spiritual discipline.